With a completely re-conceptualized conversion and extension, the Wadden Sea Centre – gateway to the UNESCO World Heritage Site – has recently been opened to the public in Ribe on the west coast of Denmark. 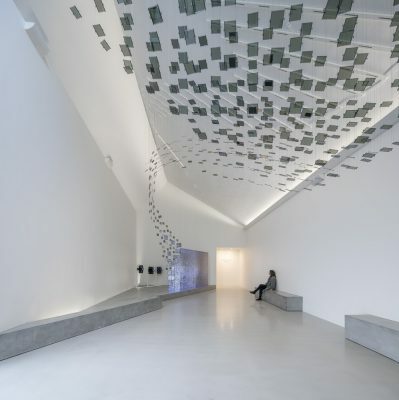 At the new Wadden Sea Centre, internationally renowned Danish architecture firm Dorte Mandrup has set a new standard for combining the local building culture and history of the area with an ultramodern, sculptural architectural appearance. The Wadden Sea Centre – the gateway to the UNESCO World Heritage Site – has recently been inaugurated on February 2. The Wadden Sea Centre conveys the story of one of the world’s most unique and significant natural resorts that, among other things, ensures that 15 million migratory birds are able to forage on their flight between North and South. After eighteen months of intense work to convert and expand the original building, the new exhibition centre has now been finished and comprises of 2,800 square meters for exhibition and communication activities. Through large glass panels a number of the rooms are fully integrated with the outdoor exhibition area as well as with the surrounding landscape. “From the very beginning we have chosen an integrated approach to the architecture and exhibition – for example, we have been conscious about the use of daylight throughout the exhibitions as well establishing contact with the surrounding landscape”, Dorte Mandrup, founder and owner of Dorte Mandrup A/S says. Mandrup emphasizes that it has been an important aspect of the project to understand and build on the local building tradition of four-winged thatched farmhouses. Through the extensive conversion the original three-winged exhibition building has been extended to four wings providing shelter in the open landscape. The building materials are largely local and absorb the salt in the Wadden Sea air as is historically the tradition for buildings in the region. “The straw that we have used has been harvested just around the corner in the local area. With thatching, we build on an ancient handicraft. When straw is unprocessed and recently harvested, dried and tied in place, it’s a very beautiful material. Unlike many other materials, the straw is naturally impregnated by the salt in the air coming from the sea. In almost every way we have aimed to root the building in the local surroundings and nature so that visitors are able to have a complete experience by visiting the Wadden Sea Centre, “Dorte Mandrup says. “The main concept of the architecture is a new sculptural interpretation of the existing building culture of the region. It has been our ambition to build a project that points towards the future and has its roots in the local building tradition and history. Thus we aim to bring the architecture of the Wadden Sea into the 21st Century”, Dorte Mandrup says. The new Wadden Sea Centre is supported by Realdania, A. P. Møller og Hustru Chastine Mc-Kinney Møllers Fond til almene Formaal, Arbejdsmarkedets Feriefond, Friluftsrådet, Louis Petersens Legat, Bevica Fonden and Augustinus Fonden. The Danish Wadden Sea was together with the Dutch and German Wadden Sea classified as UNESCO World Heritage in June 2014 and is among the 200 nature areas across the globe designated as the nature’s elite and thus obliges politicians and communities to ensure that they are preserved so they can be handed down to future generations. The Wadden Sea is the world’s largest contiguous tidal system. More than 10,000 animal and plant species live here, and 15 million migratory birds annually use the mudflats for provisioning as they travel North and South along the East Atlantic Flyway migratory route. Founding partner and owner of Dorte Mandrup A/S, Dorte Mandrup has a line of internationally recognized, iconic buildings to her name in Denmark and internationally, including the Icefiordcentre in Ilulissat, Greenland, the global meeting centre IKEA Hubhult in Sweden and the renovation and extension of Arne Jacobsen’s school Munkegårdsskolen in Denmark. Honorary Professor at the Royal Danish Academy of Fine Arts, School of Architecture, Board Member of the Louisiana Museum of Modern Art, Member of the Historic Buildings Council, appointed by the Ministry of Culture, Denmark. Dorte Mandrup has received several honors, among others Bauwelt Prize, AR Award for Emerging Architecture, The Dreyer Foundation Honorary Award, the C. F. Hansen Medal, and Danmarks Nationalbank’s Anniversary Foundation’s honorary grant.